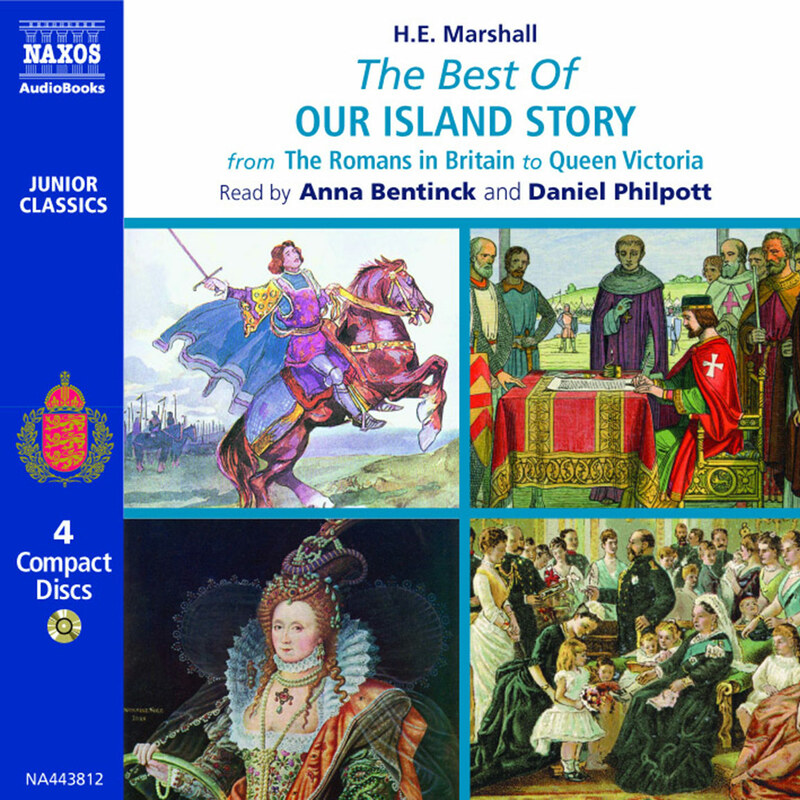 H. E. Marshall’s classic children’s chronicle of Britain Our Island Story includes all the best-loved (and most infamous!) stories from history: King Alfred and the cakes; King John and the Magna Carta; Lord Nelson and the Battle of Trafalgar; Queen Elizabeth and the Spanish Armada; and many others. This box set contains the complete and unabridged text, released previously in separate volumes. It is read with aplomb by Anna Bentinck and Daniel Philpott. 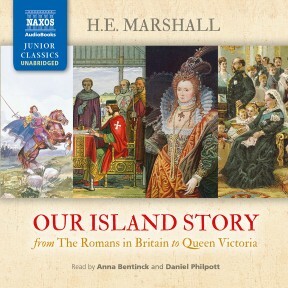 Naxos’s recordings of H. E. Marshall’s Our Island Story is a jewel in the crown. Written at the height of Edwardian confidence in the British Empire, it tells the history of Britain from its beginnings to the death of Queen Victoria. This is exactly what children need to counter the disconnected history now taught in schools. 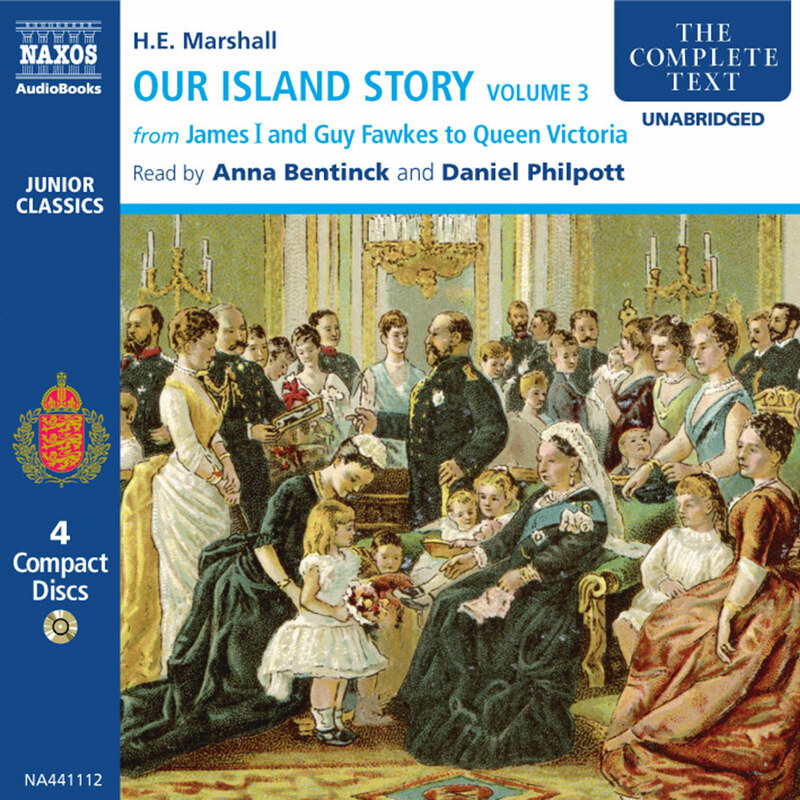 Read by the dulcet Anna Bentinck and the noble-sounding David Philpott, with stirring music from Naxos’s library of recordings, each of the three volumes give a child five hours of fun. History has all the best stories, and all the best histories are more compelling heard aloud. 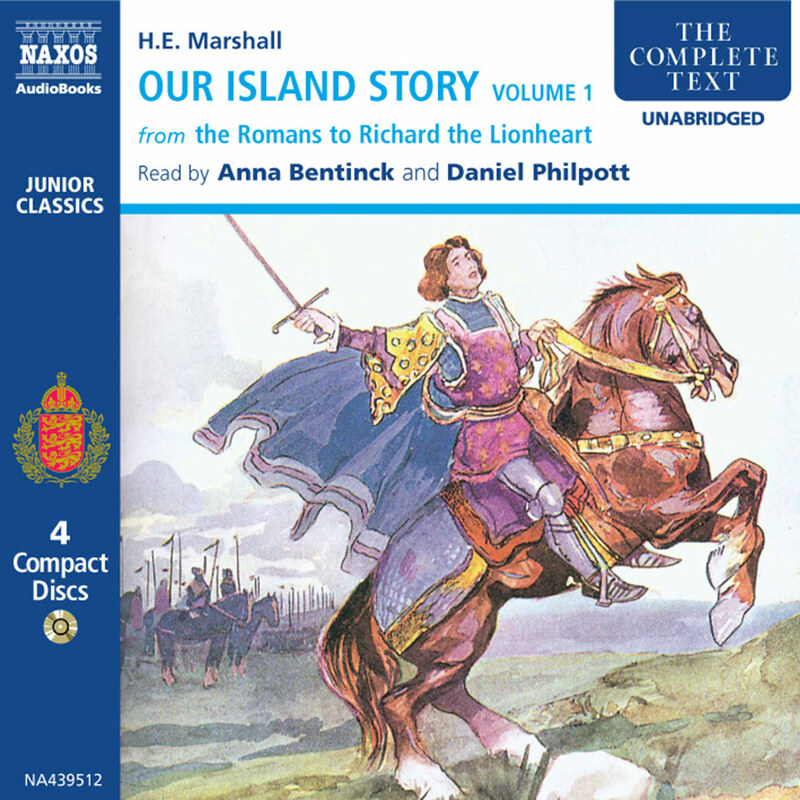 The immediacy of H. E. Marshall’s Our Island Story turned several generations of twentieth century children into history addicts. Long-rubbished by the politically correct, it has just enjoyed a centenary renaissance in print, and could do even better as an unabridged audiobook as much for parents as children. Here is the history that we grew up on: Boadicea and Caractacus standing up to the Romans, King Arthur and his Round Table, Alfred burning the cakes, Blondel seeking out Richard the Lionheart, the princes in the Tower, Guy Fawkes, Bonnie Prince Charlie, Wolfe at Quebec, Wellington at Waterloo, Florence Nightingale, the Black Hole of Calcutta and the relief of Mafeking. Some of the euphemisms will raise belly-laughs (the Romans “were rude to Boadicea’s daughters”) but there is much still to stir the spirit. 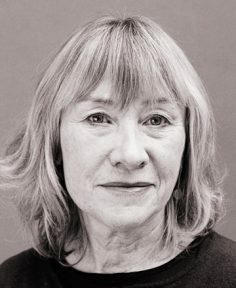 Henrietta Elizabeth Marshall admitted that it included fairytales as well as history, but she was wise about the value of legends and myths to a nation’s sense of itself. 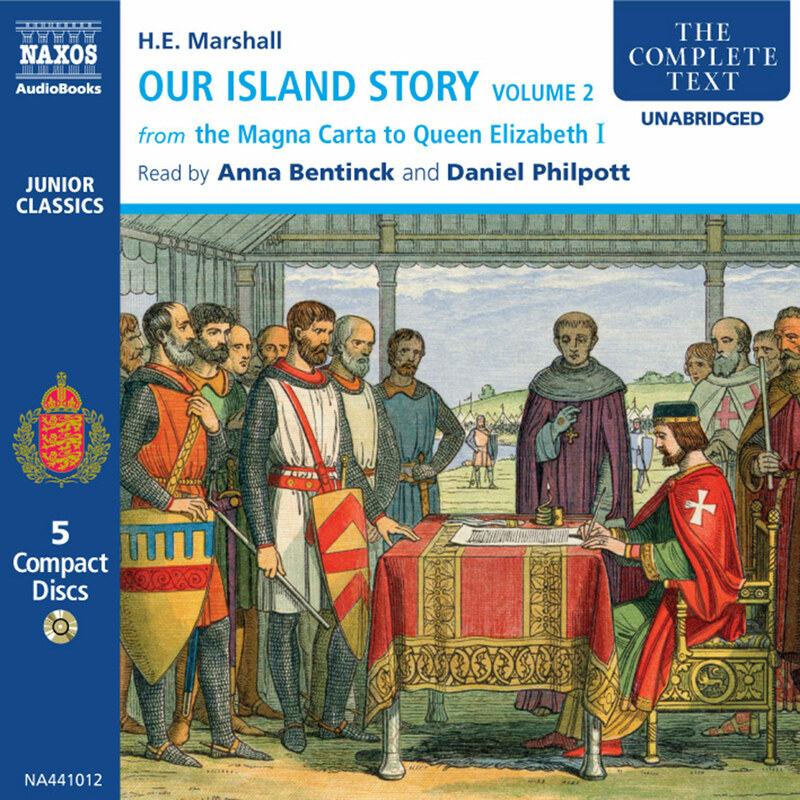 Narration is divided between Anna Bentinck and Daniel Philpott. Our Island Story is a remarkable history book. It was written at the beginning of the 20th century by H. E. Marshall – her full name was Henrietta Elizabeth Marshall – and she wrote a number of books for younger readers (boys and girls, she called them in the gracious manner of the time). They included Scotland’s Story: A History of Scotland for Boys and Girls (1906), Beowulf: Translations (1908), The Child’s English Literature (1909), A History of France (1912), This Country of Ours (1917), The Story of the United States (1919), and Kings and Things (1937). History fascinated her, and she liked nothing better than to re-tell history through the personalities of the people who made it. Our Island Story for Boys and Girls to give it the full original title, tells the story of Britain by shining a friendly spotlight on the major gures – the rulers, the heroes, the villains and even the weak and the vanquished. ‘I must tell you that this is not a history lesson, but a story-book. There are many facts in school histories that seem to children to belong to lessons only. Some of these you will not find here. But you will find some stories that are not to be found in your school books – stories which wise people say are only fairy tales and not history. But it seems to me that they are part of Our Island Story, and ought not to be forgotten, any more than those stories about which there is no doubt. So, although I hope you will not put this book beside your school books, but quite at the other end of the shelf, beside Robinson Crusoe and A Noah’s Ark Geography, I hope, too, that it will help you to like your school history books better than ever, and that, when you grow up, you will want to read for yourselves the beautiful big histories which have helped me to write this little book for little people. Then, when you find out how much has been left untold in this little book, do not be cross, but remember that, when you were very small, you would not have been able to understand things that seem quite simple and very interesting to you as you grow older. And the stories are fascinating. Generations of young readers first encountered St Alban, King Alfred, King Harold, William the Conqueror, Thomas à Beckett, Edward I, Robert the Bruce, Henry V, Sir Francis Drake, and Queen Elizabeth I for the first time in Our Island Story. These accessible life stories stayed with the young readers because the accounts are well-told – in a lively and colourful fashion. The fact that legend mixes with history doesn’t seem to matter. Wat Tyler rebelled and was slain – this is true. King John was forced to sign Magna Carta, the bowman of England won the Battle of Agincourt against exceptional odds, and the Wars of the Roses – the red and the white – divided England and civil war raged. All this did happen. But the stories of Albion and Brutus, the legendary beginnings of England, Robin Hood, and perhaps the greatest story of them all, King Arthur and the Knights of the Round Table, are the stuff of myth. Does it matter that fact and ction interweave seamlessly? Not really, because ction can in uence history, as it has done so powerfully in the case of King Arthur. Knightly chivalry has affected the behaviour, thought and art of many following centuries – including our own. Yet there is no reason to ignore the rich and thrilling history that made England and, more widely still, Britain. There may be times when H. E. Marshall speaks in a tone which seems dated; that is inevitable. Nevertheless, it is not surprising that many of our current prominent historians say it was this book that started them on the historical road, that awoke in them a love for the past, the characters and the events. She takes her story to the beginning of the 20th century, the death of Queen Victoria and the gathering clouds of the First World War. Since then another century has passed, and the world has changed in ways that not even she could have imagined. But her book lives on. The Magna Carta – the Great Charter – was a milestone in the social and political development of England. King John was forced to admit that he didn’t have total supreme control and that his subjects were entitled to have a say in things too. The great event at Runnymede on 15 June 1215, when the Magna Carta was signed by King John, gives us a vivid picture of a time when the barons supported the rights of the people. However, we know about the past not only through major political events, wars, the passage of kings and queens, and of cial records such as the Doomsday Book. We also gain much information through the art of the times – not just paintings and sculptures, but the written word, architecture and music too. Our Island Story, first published in 1905, is an enjoyable summary of Britain’s history by the children’s writer Henrietta Elizabeth Marshall. 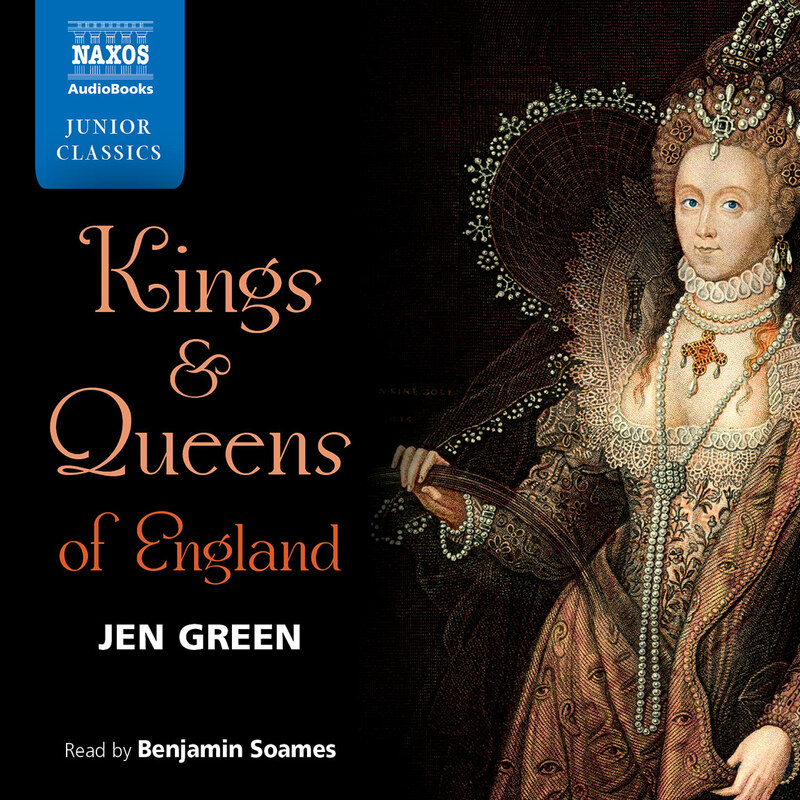 This recording covers the reign of England by two families: the Plantagenets and the Tudors. Henry II was the first Plantagenet king when he came to the throne in 1154; and the dominance of the family lasted until Richard III died in the Battle of Bosworth Field in 1485, more than 300 years later. The victor on that day was Henry IV, the first of the Tudors. The reign of his family didn’t last for three centuries – in fact, it lasted for little more than one century. Queen Elizabeth I was the final Tudor sovereign, before King James VI of Scotland became King James I of England in 1603. He was the first of the Stuarts. Artistic life changed quite a lot in those four and a half centuries. The Plantagenet reign took place in the medieval period, and the Catholic Church was a dominant force in artistic life. It was a time when the great Gothic cathedrals were built: those in Gloucester, York, Wells, Ely and Durham, for example. These large and magni cent building projects were ambitious for the age and costly to build. Each incredible example of tall, shaped stone, thrusting up to the sky, could take as long as one hundred years to complete. These cathedrals needed sacred music for the monks to sing. In the early medieval period, before the Plantagenents, the choral music was quite simple. There was Gregorian chant: nobody knew who wrote it and all the monks sang it in unison. But as the centuries went by, the music became more complex, with different lines being sung by different voices. For the first time, the names of individual composers began to emerge: John Dunstable (c. 1390–1453) lived in the reign of Henry VI; and Robert Fayrfax (1464–1521), born during the reign of Edward IV, lived into the reign of Henry VIII. There was also secular music – music which was not for religious purposes. It was by ordinary people for ordinary people, because music has always been an important part of everyday life. It was played in towns and villages by local musicians and travelling minstrels. But generally the music was not written down – people played by ear and passed on tunes from generation to generation. So we can only guess what it sounded like from the few pieces of written music (in quite simple notation) that survive. There was travelling theatre, but most of the plays were based on religious stories; or if they did involve ordinary life, there was always a moral at the end. People liked laughing, of course (life was hard but not always miserable! ), and there were entertainers such as clowns, acrobats, dancers and animal trainers. We know about all these mainly through passages and illustrations in books. Books were rare, precious and expensive – but they did exist. The written word played an increasingly important role in the medieval world. This was despite the fact that before the invention of the printing press in the 15th century, all books were copied by hand. Sometimes, in the big monasteries, there would be large rooms where one monk would read from a book and lines of other monks seated at rows of desks would write down what they heard. Many of these books would also be beautifully illustrated, with tiny drawings of animals or people decorating a letter at the start of a paragraph. The books were mainly religious, containing stories from the Bible or writings of monks. Some great folk tales from the past were written down, like Beowulf, and some poems. Increasingly, just as composers did, individual authors began to emerge. One of the first whom we know about was William Langland: he wrote Piers Plowman, the story in verse of a humble ploughman, in 1362. At the end of the 14th century Geoffrey Chaucer (c. 1340–1400) wrote his long poem The Canterbury Tales, which gives us one of the most colourful pictures of medieval life in England. Books, and reading, became more widespread after 1474 when William Caxton (c.1422–1491) started printing books in England. 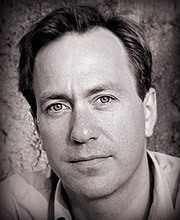 Two of his first books were Chaucer’s The Canterbury Tales and Sir Thomas Malory’s Le Morte d’Arthur, the story of King Arthur and the Knights of the Round Table. As the circulation of books grew, they began to play a major role in society’s development. Many more people started to think for themselves, and not just do what they were told to do by the Church and their lords and masters. This marked a new period in European history called the Renaissance (which means ‘rebirth’). A keen interest in the arts and education spread across Europe – and that included England. The arts themselves changed too. Composers still wrote music for the Church despite battles between the Catholics and the Protestants. In the reigns of Henry VIII and Queen Elizabeth I, composers such as William Byrd and Thomas Tallis wrote beautiful, lofty choral music to be sung in church. But they, and many others, also wrote secular music that has survived through the years – because music, like words, was printed and distributed around the country. There was music for the organ and other keyboard instruments, and for small orchestras. Other composers such as John Dowland wrote songs for lute and voice. At the Tudor court, words, and their inventive and gracious use, were prized. Courtiers, and explorers such as Sir Walter Raleigh, wrote poetry. And it was at this time that great dramatists emerged. Christopher Marlowe (1564–1593) wrote Dr Faustus, Tamburlaine the Great. Then came William Shakespeare (1564–1616). His great plays – Hamlet, Romeo and Juliet, A Midsummer Night’s Dream, Macbeth and many others – form one of the most important bodies of work ever to be produced by one man. Theatres, such as the Globe in Southwark, were built speci cally for such plays to be performed. Shakespeare didn’t only write plays. As he produced one masterpiece after another, he invented many new words. Most people who speak English throughout the world will probably say words invented by Shakespeare a few times a week – though they may not realise that he invented them. Among ‘Shakespeare’s words’ are ‘lonely’, ‘ xture’, ‘torture’, ‘advertising’, ‘blanket’ and ‘birthplace’. It is said that he invented some 1,700 words which we use regularly. Castles and cathedrals are the main medieval buildings that have survived, as well as some grand banqueting halls. But among the most distinctive Tudor buildings are the wooden houses seen in Shakespeare’s home town of Stratford-upon-Avon; the big country houses such as Hat eld House (where the young Elizabeth was told that Queen Mary was dead and she was now Queen of England); and very ornate chapels such as the one in Kings College, Cambridge. Painting also began to play a prominent role in life. During the medieval period, most painting concentrated on religious subjects, and was relatively undeveloped. But as the Renaissance owered during the early Tudor period, painting in England became increasingly sophisticated. That is why we have strong portraits of Henry VIII by Hans Holbein and portraits of other leading men of his day; and of Queen Elizabeth I and her court life. We even have exquisite miniatures by artists such as Nicholas Hilliard. It was during the Renaissance, too, that people began to take a renewed interest in the great times of Classical Greece and Rome – their architecture and their writing. This also had a strong in uence on poetry, drama and other art forms in Tudor times: we can see it in Shakespeare’s plays, such as Julius Caesar and Anthony and Cleopatra. So, artistic life developed considerably from the time of the Magna Carta and the Plantagenets to the end of the Tudors and the beginning of the Stuarts. Religion continued to play a key part in music, the written word, the visual arts and architecture. However, the lives of ordinary people became increasingly re ected in various art forms, and this contributed to a broader and more lively development. When James VI of Scotland became James I of England in 1603, and the reign of the Stuart family began, social change began to happen more rapidly and radically than before. Religion was still a most important issue for many people. In 1611, a new translation of the Bible was published. It came to be known as both the King James Bible (because it was published in his reign) and the Authorised Version. Some 50 years before, men such as William Tyndale were burnt for translating the Bible into English, but at last it was accepted that people should be able to read it in their own language. Many communities began to take their religious purpose into their own hands. In 1620 a Puritan community, feeling that it could not practise its religion freely, left England and sailed to America to set up a new home there. These people wanted to live by their own rules, not religious or social rules imposed by tradition, or by others. It demonstrated the strength of feeling within the Puritan movement in England. At the same time, men were looking at the natural world around them with new eyes. Some looked inwards, into their own bodies. In 1628 a physician, Sir William Harvey (1578–1657), discovered the circulation of the blood – the way in which the blood travels around the body. He concluded this in considerable detail even though he had no microscopes at the time to con rm it; in fact it wasn’t proven for another two centuries! Others looked outwards. In 1664 (after Charles I had been beheaded, the Civil War had been won by Oliver Cromwell and the Roundheads, and Charles II had been restored to the throne) a young man was sitting in a garden and, as the story goes, an apple fell on his head. Suddenly, he realised the principle of gravitation. His name was Isaac Newton (1642–1727) and he was just 22 years old. Between 1664 and 1666, while the plague was raging throughout England, and London suffered its Great Fire, he thought about gravitation, mathematics, and the fact that white light actually consists of all colours of the spectrum. His discoveries helped to show what our natural world was really like. In the generations that followed, more discoveries were made about biology and physics. In 1821 Michael Faraday (1791–1867), the brilliant son of a blacksmith, experimented with electromagnetism and developed an electric motor. Ten years later, in 1831, he developed the dynamo. At the same time, Charles Darwin (1809–1882) was sailing around the world on The Beagle, carefully cataloguing all that he saw among the ora and fauna of the islands he visited, especially the Galapagos Islands. This was to lead to his major book The Origin of the Species, which presented the theory of evolution for the first time in a scienti c manner. The concept of all human life evolving from tiny organisms shocked the Western world, rooted as it still was in the Book of Genesis and the garden of Eden. So, while kings and queens came to the throne, ruled and died, and men and women fought for social freedoms and rights, individuals were pushing science and invention forward in a way that was literally to transform the landscape of England and the lives of her inhabitants. In the late 18th century, the Industrial Revolution began. With the harnessing of power and development of mechanics, life under the Hanoverians became totally different. George II had been on the throne for nine years when James Watt (1736–1819) was born in Scotland, the son of a merchant. Watt proved an ingenious engineer. He started building canals – for canals were being dug all over England, providing the means for a slow but smooth method of transport which was far more reliable than travelling on the muddy, potholed roads. At the time, there were some basic steam engines which drained water from mines. Watt was asked to repair a Newcomen steam engine and decided that he could actually make it much better and more ef cient. His further developments made the steam engine work so well that some factory owners realised it could be used to drive machinery – in textile factories, for example. This ushered in a new age of powered manufacturing, and, along with other developments, sparked the Industrial Revolution. Other inventions during the reign of George III advanced the manufacture of textiles. Until the start of the 18th century, all cloth had to be woven, sewn or stitched by hand. Then, an accident in the home of a Lancashire weaver, James Hargreaves (1720–1778), changed all that. His young daughter Jenny knocked over the family spinning wheel by mistake, and James saw the wheel still spinning on its own. He realised that one wheel spinning could drive a lot of spindles! It was a ash of inspiration. In 1764 he built a machine in which eight spindles driven by one wheel could all spin thread, instead of one spindle at a time. He called it the ‘Spinning Jenny’, after his daughter. It was a basic design, and he quickly improved it so that one wheel could drive eighty spindles. The thread produced wasn’t of very high quality, but good enough for certain things. Eleven years later, Samuel Crompton (1753–1827), son of a small farmer in Lancashire, took the Spinning Jenny further. His development was called the Spinning Mule and produced better-quality thread. What’s more, he was able to link it up to a Watt steam engine and mechanise it. While this produced cheaper goods, it was not without implications. Many workers were worried that mechanisation would rid them of their jobs, and in many cases it did. Furthermore, the working conditions of most of the factories were terrible, with not only men but women and children forced to work long, hard, dangerous hours. There were many industrial injuries. It was a far cry from the slow, predictable but healthier life working on the land. The countryside was also being scarred by the Industrial Revolution. Since coal was needed more than ever before as fuel to drive the steam engines, mines were producing ugly slag-heaps; and factories and industrial waste were blackening the landscape. The poet William Blake warned of this with phrases such as ‘dark satanic mills’. But progress couldn’t be halted. With all these goods being made all around the country, ef cient transport became more important than ever before. Not since the time of the Romans did England have a properly paved road system. Coaches and wagons had to put up with poorly maintained roads which were subject to the whims of the weather, making the surface wet and muddy or cracked, dry and full of potholes. Thomas Telford (1757–1834) was the son of a Scottish shepherd. He built canals, bridges and docks – and also more than 1,000 miles of improved road in his lifetime. But it was John Macadam (1756–1836) who introduced a new construction of roads. He laid a foundation of large stones – in fact, a mixture of crushed stone and gravel – and gave it a camber (an arched shape) so that the water would run off. This was a vast improvement for the horse and coach, which was the mainstay of everyday transport. This was until the third strand of transport happened: the train. If the steam engine could drive a Spinning Mule, it could drive wheels… George Stephenson (1781–1848) started life by herding cows. When he was 18, he went to evening classes to learn to read and write. He was deeply interested in machines. He began working as a colliery engineman, and on Saturdays he would take apart Watt and Newcomen steam engines to see how they worked. He persuaded his colliery manager to see if he could develop a steam engine that would work – as he knew others were doing. By 1814 – the year before the Battle of Waterloo – Stephenson had made a steam engine that he called the Blutcher, which carried 30 tons up a hill at four miles per hour. He made more improvements and was helped by other developments happening at the same time. He realised that railroads would have to be made fairly at, though this was a challenge of its own as England was not at! It was necessary to build bridges, cuttings, embankments… and eventually tunnels. He discovered someone else who was making better cast-iron rails, and (though it cost him quite a lot of money) he decided to use those. By this time Stephenson was working on a project to build a railway running the 22 miles between two collieries, at Stockton and Darlington: the Stockton and Darlington Railway. On 27 September 1825, the railway was opened. An engine called Locomotion pulled no fewer than 36 wagons lled with sacks of coal and our, and at one point reached a speed of 15 mph! Four years later, Stephenson produced his Rocket, which won a competition to be the engine for the Liverpool and Manchester company. The opening of the railway was in 1830 and attended by the Duke of Wellington. However, it was marred by an accident when a government minister was knocked down and killed by a locomotive which he didn’t see coming. Soon, Stephenson was producing locomotives that travelled at nearly 30 mph; and train lines began criss-crossing England. At the same time, the engineering genius of Isambard Kingdom Brunel (1806–1859) was beginning to make its impact. In 1833 he became chief engineer of the Great Western Railway, which ran from London to Bristol. His viaducts, bridges, tunnels, and the station in Bristol itself made his name. His imagination and daring knew no bounds. He built the longest steamship, the Great Western, which took passengers to New York in just 15 days. It crossed the Atlantic 60 times over the next eight years. Then came the SS Great Britain, which was the first ship to have an iron hull. It was a remarkable piece of engineering. This was the first ship to be powered by a screw, which could be lifted so that the vessel could revert to a sailing ship when the wind was right. This extraordinary invention saved a lot of coal. The ship made numerous journeys to Australia. The face of England had changed, as had the pace of life. Gas lighting was now in use all over the country. As early as 1792, William Murdock (1754–1839) had managed to create a gas light in his home using burning coal; and Matthew Boult developed the concept further. By 1814 the first gas street lamps were erected, and by 1820 gas lights were common in the foggy streets of London. Many of the seemingly smaller inventions and improvements also played a vital role. James Nasmyth (1808–1890) was a Scottish tool maker. Without his massive steel hammers, the works of Brunel would not have been possible. Nasmyth also built large pile drivers and hydraulic punching machines. Henry Bessemer (1813–1898) developed new ways of producing higher-grade steel from molten pig-iron. He used it to make train rails, but also guns – for the military realised very quickly how useful these inventions were for the process of war and killing. Bessemer wasn’t the only inventor to be drawn into the demands of war. Sir Joseph Whitworth (1803–1887) used his inventiveness to design ri es and eld guns. When Queen Victoria died in 1901, England and the world were facing an even faster rate of social change. The very concept of change was becoming in-built into society. This was quite unlike the time of James I, when, generally, society wanted and expected stability, and only a few far-sighted men realised that individuals could be free and more in charge of their own destiny. In the time of James I, if you were born a shepherd, the likelihood was that you would die a shepherd. But 300 years later, this was not so. If James I wanted to travel from London to Canterbury, it would have taken him about the same time as it took Chaucer with his pilgrims, 200 years earlier. By 1900 the time, by train, was cut to a little over an hour – scarcely time for the first of Chaucer’s tales, told by The Knight, to be completed.